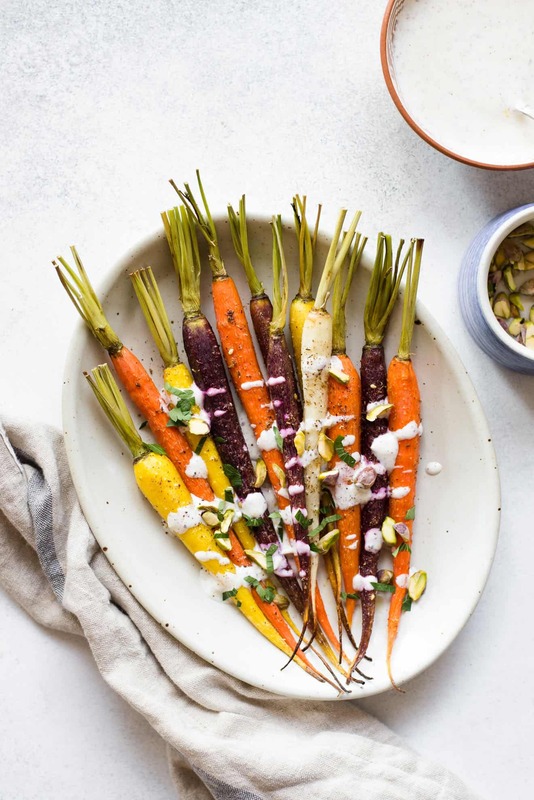 These rainbow za’atar roasted carrots are topped with a tangy sumac yogurt sauce, chopped pistachios and parsley. It’s a simple, healthy side dish that’s great for any gathering. Thank you Nugget Markets for sponsoring this post! Giveaway details are below. Okay, the holiday madness is about to sink in. You realize that you’ve been invited to 10 holiday parties, and you’re starting to panic because you have no idea what to make for them. Fear not. I have an easy-to-prepare side dish that you can bring to any gathering. 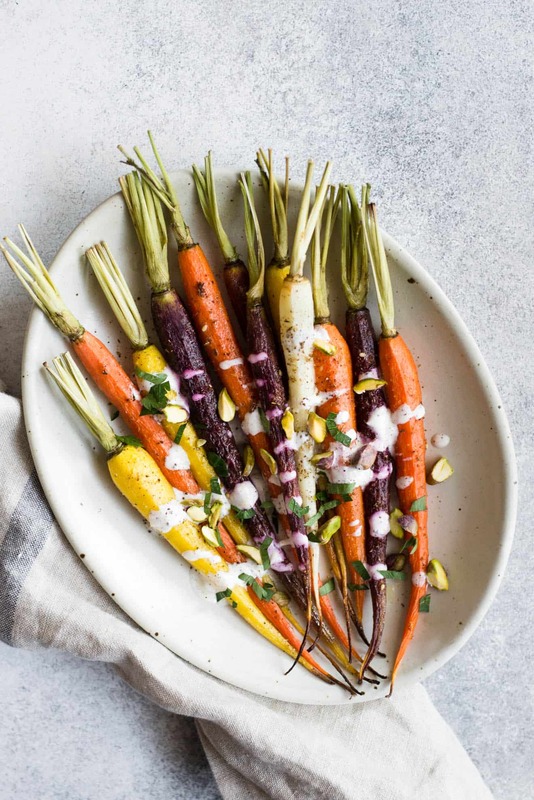 It’s roasted rainbow carrots that are seasoned with za’atar and ground coriander. Za’atar is a very common Middle Eastern spice blend that’s earthy, nutty with a touch of tang. The blend usually contains thyme, ground sumac and sesame seeds, but the exact spice combination differs between various spice companies. Before I go any further, let’s talk about sumac. Sumac is another spice you would often see in Middle Eastern cuisine. They’re red berries that grow in bushes that are dried and ground to produce the spice. Their tangy flavor reminds me of lemon juice but without the acid. I’m using ground sumac in my yogurt sauce because the tanginess pairs very well with the slightly sour qualities of yogurt. I know that these Middle Eastern spices can be difficult to find sometimes, but fortunately, Nugget Markets carry a wide selection of herbs and spices, including za’atar and sumac! Every time I walk into the store, I’m impressed by the variety of spices and sauces that I can find there. But don’t take my word for it—find out for yourself! [UPDATE: The giveaway is over] I’m giving away a $100 gift certificate to Nugget Markets. Entering the giveaway is easy. Each person can submit up to 5 entries. You can comment on this blog post, subscribe to my YouTube channel, or visit my Instagram, Facebook and Pinterest pages for a chance to win. After you complete each entry, be sure to come back to the widget and hit “Continue” to make sure that it records your entry properly. That’s it! The contest ends on November 22, 2017 at 11:59pm PST. From start to finish, this dish took about 30 to 35 minutes to make. It’s so easy to prepare and it adds a lovely color to your holiday table! Making a double batch: If you’re cooking for more than 4 people, double the amount of the ingredients for the roasted carrots. The yogurt sauce recipe specified below should be enough for 2 batches of carrots. What to do with leftover sumac yogurt sauce: It’s a fantastic dip for vegetables or crackers. The sauce also pairs very well with fritters, like my leek and kohlrabi fritters! Preheat the oven to 375ºF. Line a large baking sheet with parchment paper. Position an oven rack in the center position. 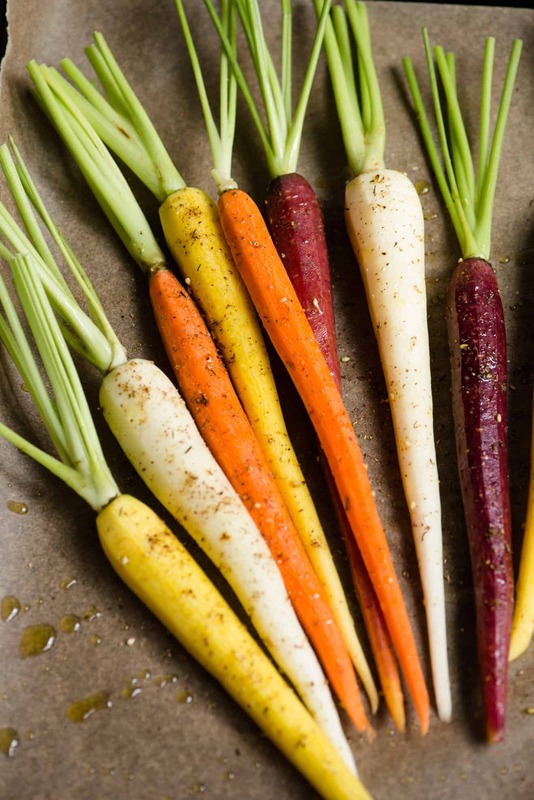 Drizzle the olive oil over the carrots. You can do this inside a large bowl or over the baking sheet. Rub the oil over the carrots to make sure that the surface area of the carrots are covered in oil. Mix the za’atar and coriander inside a small bowl. Sprinkle about 2/3 of the spices over the carrots. Then, sprinkle in the salt. Line the carrots around the baking sheet. 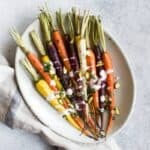 Bake the carrots for 20 to 25 minutes, until they’re fork tender. If you are working with thin carrots (about 1/2 inch around the stem), the carrots will take about 20 minutes to cook. If you are working with carrots that are roughly 1 inch at the stem, they’ll take about 25 to 28 minutes. You can always slice the thicker carrots in half to speed up the cooking time. 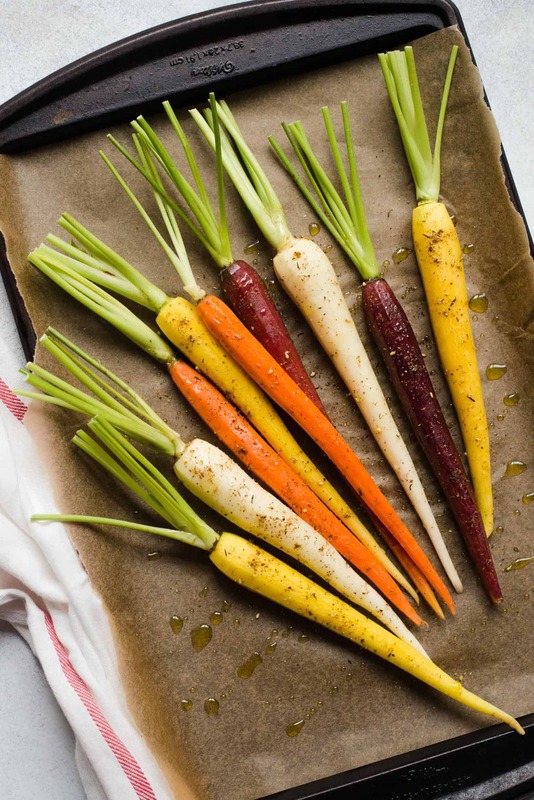 Rotate the carrots halfway through roasting so that one side doesn’t get too brown. While the carrots are roasting, prepare the yogurt sauce by adding all of the ingredients to a bowl and mix well. Once the carrots are done, sprinkle the rest of the za’atar and coriander mixture over them. Transfer the carrots to a serving plate. Drizzle the yogurt sauce on top. Sprinkle the chopped pistachios and chopped parsley over the carrots. Serve immediately. *I like using full-fat plain yogurt for this recipe because of its richness. Low-fat versions tend to be a little too sour. I tested the recipe with Greek yogurt and I thought it was too thick. I had to thin out the yogurt sauce with a few tablespoons of water. Disclosure: This post was sponsored by Nugget Markets. Visit their website for more information or follow them on Facebook or Twitter! Click here find a location near you. Sounds and looks delicious! Now know what my CSA carrots were destined to be! Thanksgiving is right around the corner 🙂 i’m going to be making this as an appetizer. Thank you for your inspirational delicious meals! Happy thanksgiving from my kitchen to yours! Roasted and charred brussels sprouts, 100%! It is hard to pick a favorite but my favorite holiday side dish is mashed potatoes. Green bean casserole is great, and stuffing is amazing but for me you just can’t do the holidays without mashed potatoes. Definitely can’t go without the mashed potatoes! I enjoy sumac and can’t wait to try these. Might do the same thing with parsnips. That’s wonderful that you enjoy eating carrots now! I appreciate how you introduce spices and ingredients that are outside of the box for most of us. I live in the SF Bay Area and hopefully will be able to find what I need to make this recipe. If not, I guess I’ll just have to drive to Nugget Market in Sacto! Hi, Kathleene! Za’atar and sumac are definitely available at a lot of natural foods stores in the Bay. I was able to find it when I lived there! I have to give it to the green beans. Slow cooked with bacon, mushrooms and sweet onion. Sometimes I add a little sliced rope sausage to it too. Thanks! My gosh, reading this just made my mouth water! Love visiting Nugget Markets, not only do they carry a variety of products, but their juice bar has helped me try ingredients I might not have tried on my own! I’m excited to pick up the needed ingredients for these carrots, I’ll taste-test them this weekend for the upcoming holiday dinners! So glad that you enjoy shopping at Nugget, too!